The island of Tenerife with its over 10,000 feet volcano provides a great diversity in the Walking / Hiking routes available. From the sometimes Snow covered Mount Teide, the warm lovely south coast, the rugged and wild north east coast to the climatic Pine forests allow hundreds of kilometres of paths and trails in these environments to be experienced. To walk many of these inland paths and trails, a car is essential, but many of the excellent coastal walks near your resort may be reached from your accommodation without a car or perhaps just a bus. The promenade extends for around ten kilometres, from Los Cristianos. Passing Playa de las Américas, San Eugenio, Puerto Colón, Playa del Duque and ending in the fishing village la Caleta. There are plenty of bars and restaurants along the way for re-fueling and watching the world go by. The route back can be done by taxi for around 6 to 10 Euros depending where the taxi is taken from or even better catch the Titsa bus from La Caleta to Los Cristianos. The bus number is 467 with Destination: Costa Del Silencio and runs every 20 minutes at a cost of around 1.50 Euros. From Amarillo Golf there is a constructed path that follows the beautiful rugged coast to Los Abrigos a distance of around 3.25 kilometres The route can be extended via unpaved tracks to El Medano, a further 6.30 kilometres. ( Try to keep off the BUSY main road from Los Abrigos to El Medano) This route passes the Red Mountain - Montaña Roja and the long sandy beaches near El Medano. On return why not catch the Titsa Bus from El Medano and drop off at Pueblo Primavera (near Golf Del Sur) then a short walk down the hill to Marina San Miguel. The bus number is 470, with Destination: Los Cristianos and runs every hour on the half hour at a cost of around 1.45 Euros. The walk along the beautiful Masca Ravine starts from the hill village of Masca and follows down to the coast. The walk to the coast is around 2.5 Miles (4 km) and follows a unmarked track/s down the stream bed. Not difficult but be well prepared - Trekking/Walking poles useful, and boots giving ankle support advised. Due to the descent of around 2,400 feet to the coast, an option for this walk is to catch a taxi from Los Gigantes to Masca village ( to avoid driving the narrow hair raising road to Masca). Cost is around 23 to 27 euros. Walk the Ravine, and wait for a Water Taxi to take you back to Los Gigantes. You will need to pre-book the Water Taxi first thing before you leave Los Gigantes (Cost from 10 Euros). There are 3 taxis located at the marina - an early start is advised. The maritima acantilados have 3 boats all located on the marina in Los Gigantes. 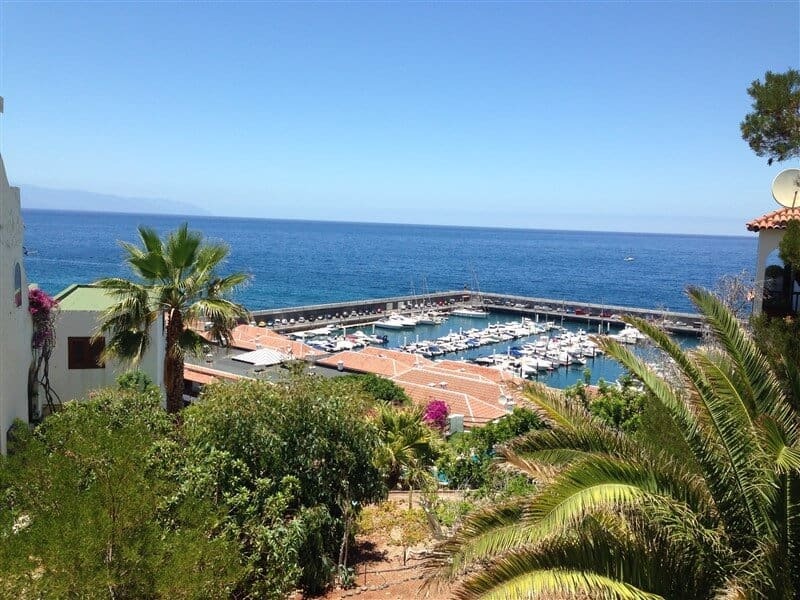 They have two offices the first is located on the marina / beach road near the barrier and is open from 08:30 to 19:00 the other is opposite the big supermarket in the center of Los Gigantes open from 09:30 till 13:00. Please check out the Masca review on Trip Advisor to acertain the walk itself and your suitability. Please note: the Masca Gorge is currently closed to all tourists until further notice. This is due to storm damage of the Masca Jetty and the authorities are evaluating the Gorge for safety due to recent rescues. Recently re-opened, Barranco del Infierno is a nature reserve in the municipality of Adeje, in the island's southwest, whose more than 1,800 hectares (7 square miles) harbour one of Tenerife's most rugged natural landscapes. For just this reason, and for its quirks of topography, it has become a very popular hiking route. One of those quirks is the gorge which gives the reserve its name - a metres-deep cleft produced by millenia of water erosion. Other areas of the park worth visiting include the Rocks of Conde, of Imoque, and of Abinque. The vegetation here is another reason why this is one of the most beautiful spots on the island for nature-lovers. A lovely walk to Lunar-hoodoo like structures through a pine forest. A circular walk starting from the off-road track, not to steep, it is uphill nearly all the way to the structures and then downhill back to the start. The climb is around 1,186 feet approx. a distance of around 4.13 Miles. Allow 3 to 5 hours depending on speed and fitness. Route is well waymarked. North of Villaflor, take unpaved track on the sharp bend (shown in blue), this is easily driveable and follow track for around 2 miles then find a place to park when you see the Waymarked posts. A lovely circular walk not too difficult passing the Erjos pools then up on to the ridge road before looping into the Laurel forests and finally a walk down from the ridge passing the pools once again and back to the start at Restaurante Fleytas where some nice beer (or tea) and cakes at the bar can be consumed. The Erjos pools have naturally formed in old quarry workings and provide a good habitat for birds and wildlife. Being situated in the Teno area to the west, low cloud and mist is very common, so pick a nice clear day to appreciate the lovely views of the Teno area and Mt Teide from the ridge. The climb is around 850 feet approx. a distance of around 3.75 Miles (6km). Allow 2 to 3 hours depending on speed and fitness. North of Santiago del Teide, park near Restaurante Fleytas. The last volcano to erupt in tenerife was Chinyero in 1909. The lava flowed westwards and stopped overlooking Santiago del Teide. This is a lovely circular walk around the volcano and crossing the lava field to the west. Its around a 3 hour walk including lunch stop, a distance of just over 4 miles and a 1000 ft ascent and decent. See location Map - Purple Star. Situated on the TF38, park at side of road at CP1 or CP2 on map. If parking at CP2 you can take the dotted track to avoid main road. Nice if energetic walk through the Anaga mountains (Rain/Mist Forest). Its around a 4 - 5 hour walk including lunch stop, a distance of nearly 8 miles and a 3000 ft decent and ascent. Best on a sunny not misty day and at Chinamada it is well going to the Mirador - see blue dotted line on map. Nice Bar at Las Caboneras for well earned refreshment.